Words from a Cali living, flip flop wearing, martini sipping gal who wants to share a few thoughts on food, wine, life, and whatever else comes to mind. ← Possibly the cutest trench ever! Springtime treats… they’re worth the fuss! English peas, pea tendrils and fava beans… I wish we could enjoy these treats year round. Right now you can find them at your local farmers market, but since they’re days are limited, I buy them every weekend until they’re no longer! I hit the Beverly Hills one on Sundays and it’s always a packed scene. There I am browsing and listening to fellow shoppers discuss recipes and thoughts on ways to cook certain items, I turn and am standing next to Wolfgang Puck (a regular on Sundays). Always a treat, we discuss leafy greens and shucking peas and how it’s time consuming. Nothing too life changing but you just feel the inspiration standing next to a great like that. So I grab some greens and head home. My eyes are WAY bigger than my stomach when it comes to all these beautiful veggies. How do you eat all of this soon after you buy it? You don’t want it to go bad! I end up making many different sautes and stir fries for lunches and dinners. 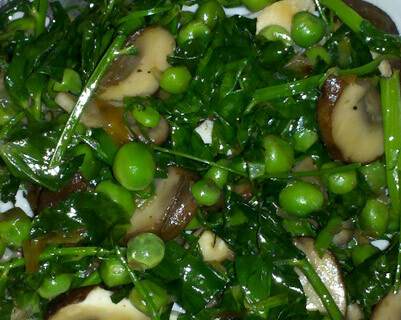 The first saute I made was a crimini mushroom and pea tendril saute. I was so easy! Of course, since they were there, I grabbed some fresh peas to toss in as well. This followed a recipe I found epicurious.com and then just added my own twist. Saute the leek in the butter (yum!) until soft. Add garlic and ‘shrooms until browned. Toss in the pea tendrils and continue cooking until wilted. In the meantime I did a REALLY quick blanch of the peas I had shucked and then tossed those in last so they kept their crunch. The next item I had to make sure I didn’t let go to waste were the fava beans I had grabbed. 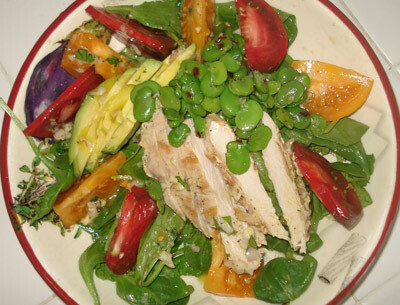 I ended up throwing together a salad with some baby spinach, fresh heirloom tommies, some grilled chicken I had in the fridge, sliced avocado with sauteed fava beans tossed in a shallot vinaigrette. It was a random mix of flavors, but it worked! I did saute the favas quickly in EVOO, S&P and some red pepper flakes. 2 Responses to Springtime treats… they’re worth the fuss! i thought i would have to stop reading this after the trenchcoat post but i guess you have redeemed yourself. San Francisco hates my car.